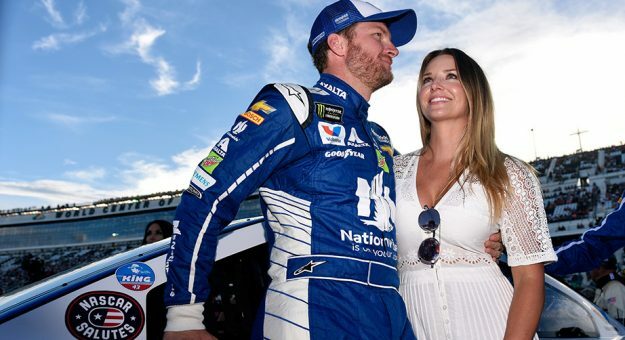 Since announcing a “baby Earnhardt” was on the way in October 2017, Dale Jr. and wife Amy have had the racing community eagerly awaiting the arrival of their baby girl. And now, the countdown is over. The happy couple welcomed Isla Rose Earnhardt on April 30, the first child for both, revealing the baby’s birth on Tuesday morning. Dale Jr. has been open about his excitement to enter the fatherhood fraternity throughout the pregnancy. Sharing his thoughts on social media, the former driver has given fans an inside look into the couple’s experience. He even gave updates on the size of the baby throughout the trimesters on Twitter. The baby was born the day after what would have been Dale Earnhardt’s 67th birthday. In an interview on the Dan Patrick Show, he talked about how quickly his life has changed since hanging up the fire suit at the end of the 2017 Monster Energy NASCAR Cup Series season. “You’re driving 200 mph last year and now you’re going to try to put a baby seat in a Suburban — what happened to you, Junior,” Patrick quipped at Earnhardt, who laughed. “I’m becoming a father,” he said. Earnhardt Jr., who is 43, and Amy wed on New Year’s Eve in 2016.